Wisconsin Governor Scott Walker. Photo credit: Andrew Harrer/Bloomberg. With a few strokes of his pen, Gov. 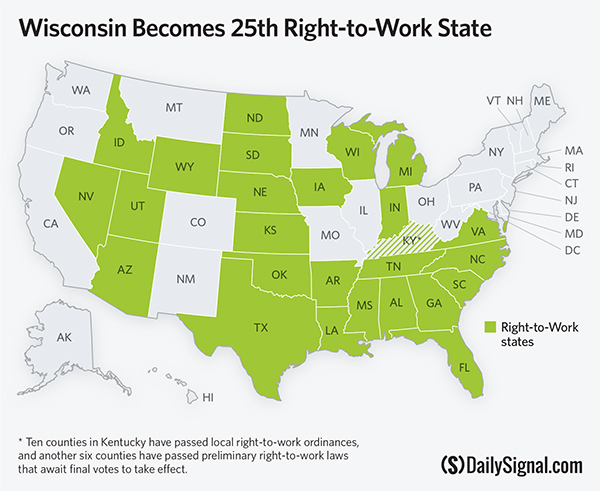 Scott Walker expanded worker freedom by making Wisconsin the 25th Right-to-Work state. Walker signed the bill at the Milwaukee factory of Badger Meter Inc. in Milwaukee, saying it represented "one more big tool" for attracting businesses and investment to the state. With the passage of the law, Badger Meter has said it would start making a new product line at the plant, hiring twelve workers in the coming months with the potential to hire more. "This sends a powerful message across the country and across the world," Walker said. "'Wisconsin is Open For Business' now is more than just a slogan. It's a way of doing business." Wisconsin joins Michigan and Indiana as Midwest states that have gone RTW. If the results are like them, expect Wisconsin’s business climate to improve. Michigan, birthplace of the United Auto Workers, became the 24th RTW state in December 2012. No longer is it “being eliminated at the early stages of searches,” according to a Chicago real estate developer. Since right-to-work work took effect in March 2013, 142,000 more people are employed in Michigan and private-sector weekly earnings have increased 5.4 percent, outpacing the national average of 3.7 percent. I’ll give you a couple of data points. Since the passage of our right-to-work legislation, 120 companies have communicated with our economic development team that our enactment to right-to-work would factor into their decision-making. Eighty-two of those projects have progressed to the pipeline stage and account for the potential of more than 9,000 projected new jobs and more than $2.9 billion in investments. Of the 82, 64 companies have already accepted. When announcing that he would sign the RTW bill, Gov. Walker explained, “This reform is pro-freedom and pro-work for Wisconsin.” No one should think the Right to Work is a silver bullet for a state like Wisconsin. There are many factors like taxes, regulations, education, infrastructure, etc., that contribute to a state’s business climate. But worker freedom matters, not just to the workers themselves, but to a state's competitiveness and job-creating potential.